May 11, 2007: Sunny and Hot, Water Temp 74* and Clear. Got on the water at 4 am this morning to catch bait and picked clients up at 6:15 and headed for a mid lake flat. Set out my spread of 10 Water Bugz Planner boards and a bobber with a big Gizzard on it. Right when we hit the flat we got bit , caught a Catfish on the only Herring I put out. I replaced it with a big Gizz and ran Gizzards the rest of the day. Once we started catching fish another guide and a bass boater busted us and tried to crowd us out of the area but we hung there for a couple of hours until the sun got up too high and the fish pulled off the flats. The nicer Stripers definitely wanted the bigger Gizzards because we were catching 10 pounders and the other guide who was using Herring only caught punks. We went and caught more bait and set up on some fish in the 20' range with downlines. Three lines went down at once then a troller came over and ran his motor around us for 30 minutes so we moved to another spot. It was a good move because I no sooner started putting the lines out and we started getting jammed. We nailed them on this last spot pretty good to finish out the day. Today we had over 35 strikes, caught 3 10 pounders and clients kept 16 Stripers for 100 pounds . Brandon is shown holding two of the ten pound fish he "redeemed" himself with. 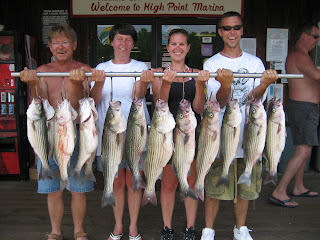 On Friday, May 11 I picked up my clients at High Point Marina for a half day of striper fishing at 6:30 am. 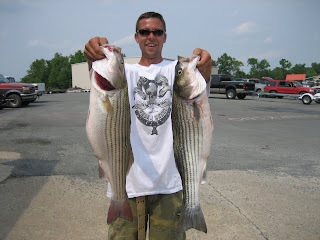 I had plenty of bait and knew where the fish were based on my 15 years of guiding knowledge and because my other striper guide, Doug Ball, and I like to work together to stay on fish. I started just below Rose Valley Island where the fish go each year around this time and set out two free lines and two planer boards. In about an hour we caught six fish, three keepers. While we fished, we saw the guide that hosts this horribly self worshipping blog and the bass boater he refers to. Since we arrived after each, we maintained proper distance and gave way as we would have liked to have been treated. After the action slowed, we rolled over to the region just above Stubbs and caught the rest of our limit and then bass fished for the last hour of the trip. No one doubts Hemby's ability to find and catch fish, however his disposition toward people he thinks are "crowding" him is so self-centered it's laughable. Advice to Mr. Hemby: when blogging, stick to the fishing information and not lordly commentary on other anglers because you might just pick a scab bloody. See you on the water, Jim. It's going to be a great summer of striper fishing.